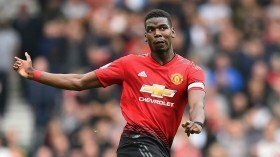 Former Manchester United and Everton star Phil Neville believes Paul Pogba can be regarded as the best midfielder in Europe when he is playing to the best of his abilities. The France international had gone through a tough phase under Jose Mourinho during the opening months of the season and there was one time where he was completely dropped to the bench. However, with the Portuguese sacking, Pogba has returned to the United XI under the guidance of caretaker Ole Gunnar Solskjaer and he has already made a huge impression with two goals and two assists in the past two matches alone. Speaking on BBC Sport, Neville praised the attributes of the former Juventus man and said that the Frenchman can be regarded as one of Europe's best midfielders when playing at full throttle. "They had the best player on the pitch and probably the best midfielder in Europe on his day in Paul Pogba who has had a disappointing, horrendous last 18 months at the club because of the fall-out with the manager," he said. United have recently secured back-to-back triumphs over Cardiff City and Huddersfield Town and the results see them within eight points off fourth-placed Chelsea.